Statistics show that people are living longer. That’s indisputably good news, but it also means that investors need to think more about retirement planning to make sure their savings last as long as they do. 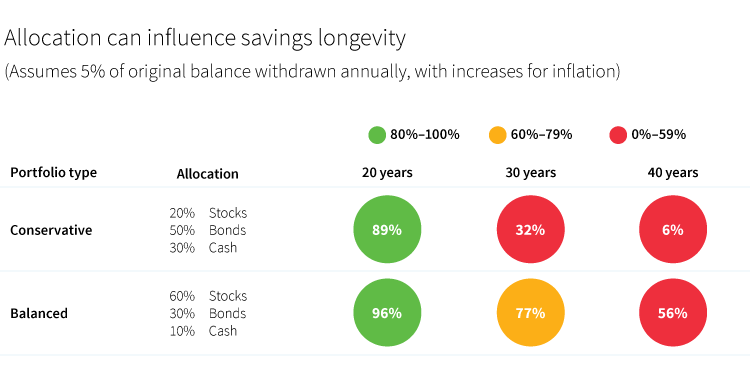 Understanding the impact of longevity on savings as well as planning early may help to reduce the risk of running out of money in retirement. The Social Security Administration estimates that, based on average life expectancy, a 50-year old woman today is likely to live to age 83, and a 50-year old man is likely to live to 80. But an average doesn’t tell the whole story. More than half of women (56.4%) and men (55.4%) are expected to outlive those estimated expectancies. More people are living into their 90s. The SSA research noted 30% of women and 19% of men who are 50 years old are expected to see their 90th birthday. 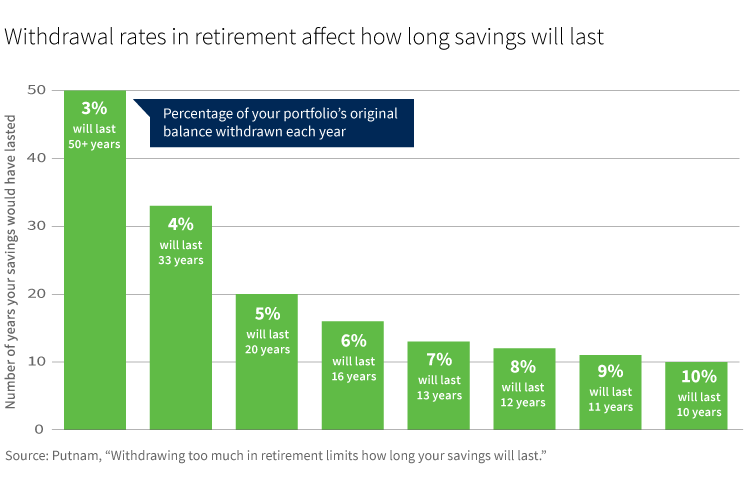 Many people underestimate the number of years they need to plan for when saving for retirement. In fact, some studies note more than half of retirees find their calculations were short. A recent Empower Lifetime Income survey noted only 41% of individuals knew how much they needed for retirement and only 35% believed they were financially prepared. Although no one can predict the exact length of retirement, acknowledging the issue of longevity may help guide planning strategies. This chart illustrates how long a hypothetical portfolio of 60% stocks, 30% bonds, and 10% cash, regardless of account balance, would have lasted on average given various withdrawal rates. All withdrawals represent the percentage of the original account balance that is taken out each year. Withdrawals were increased by historical inflation each year. Remember that all assets do not need to be conservatively positioned. A significant drawdown in retirement is a valid concern, but being too conservative may be an obstacle to ensuring that savings last. Individuals who have a workplace retirement savings plan such as a 401(k) may find that plan may be an attractive savings program, especially if their employer offers a company match. These workers may want to take advantage of auto-enrollment and begin saving directly from their paycheck without having to remember to make contributions. Auto-escalation can help them increase their savings deferral rate each year to get to higher levels. (For additional discussion about workplace savings plans and the benefits of auto enrollment, visit From Here to Security, a blog featuring information and advocacy for modernizing workplace savings plans). While many organizations encourage a standard of 10% or more, some note that even higher levels of saving may be needed. Researchers at the CFA Institute Research Foundation, for example, recently cited 15% as a starting point. Other retirement savings vehicles include Roth IRA accounts. Savers using a Roth may want to put the full annual allocation in as early in the year as possible. Once that commitment is made, they can plan the rest of their budget. There are additional options available to help supplement income in retirement such as purchasing guaranteed income products. Because these products may be complicated, it’s important to seek professional advice. Longer life expectancies offer the hope of a longer and more satisfying retirement, when individuals can have time to spend with friends and family or pursue goals they delayed during their working years. Exploring the number of savings options available to individuals and in the workplace, as well as giving attention to financial planning, can help to make the retirement years more secure and abundant. These illustrations are based on a rolling historical time period analysis and do not account for the effect of taxes, nor do they represent the performance of any Putnam fund or product, which will fluctuate. These illustrations use the historical returns from 1926 to 2016 of stocks (as represented by an S&P 500 composite), bonds (as represented by a 20-year long-term government bond (50%) and a 20-year corporate bond (50%)), and cash (U.S. 30-day T-bills) to determine how long a portfolio is likely to last given various withdrawal rates. A one-year rolling average is used to calculate performance of the 20-year bonds. Past performance is not a guarantee of future results. The S&P 500 Index is an unmanaged index of common stock performance. You cannot invest directly in an index.